Dumplings you eat with a straw! My first memory of international cuisine was when I was 12 years old. I’ll never forget going to a Chinese restaurant in Peoria, Illinois for the first time. It was darkly lit, with big round tables and little cups for tea. I was fascinated with these cups because they didn’t have handles – unconventional for my Midwest life. My dad ordered some dishes for our table; sweet and sour pork, wontons, egg foo young, and pork chow mien. I remember being that awkward age that hated eating anything that I didn’t know, but wanting to try new things. I had no idea how to use the chopsticks in front of me – they seemed as confusing and impossible as solving my Rubik’s Cube – but that was the first of many Chinese dinners I had in my hometown of Peoria. 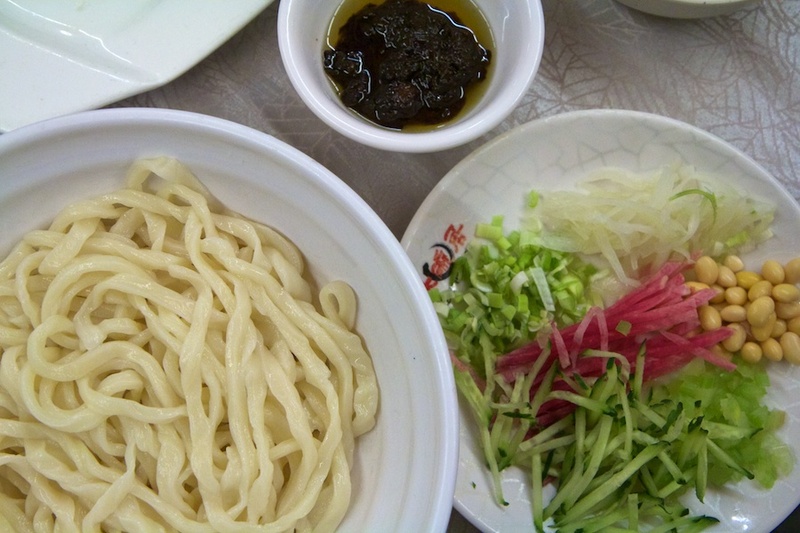 Chinese food reminds me of my childhood and exploration of new things, so when I landed in China for my 8 day trip with Wendy Wu Tours, I was excited for one thing – I wanted to eat! Though China may seem daunting due to the language barriers, your local guide can lead you through all the tough decisions – like what to eat! They can help you order and work your way through the maze of menus. Most of the restaurants that we went into were gigantic, with big round tables and a lazy Susan in the middle for easy sharing. 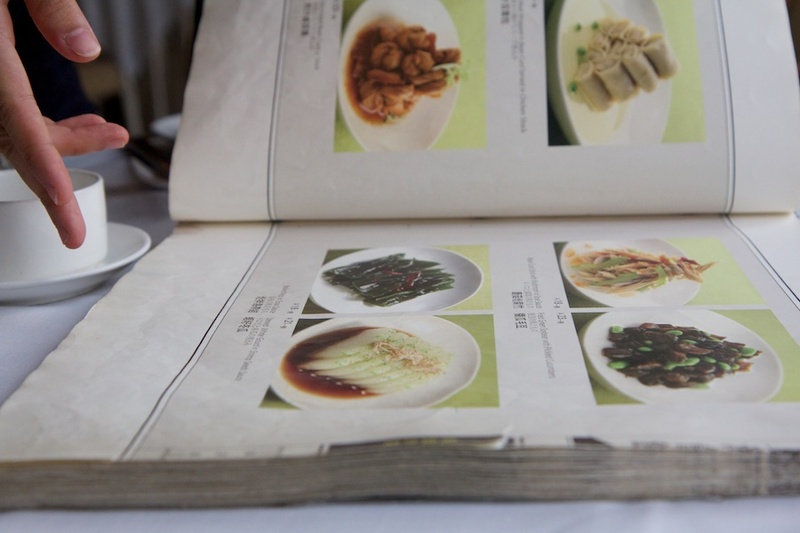 The menus tended to be the size of an old Sears Catalog and include pictures and English, which made things a little easier. These are great places to eat but it you want to throw caution to the wind and find some restaurants that are smaller and don’t have pictures or English menus, then just ask your guide and they’ll lead you deep into the alleys of China to eat. After all, travel is about going local and exploration of new things! 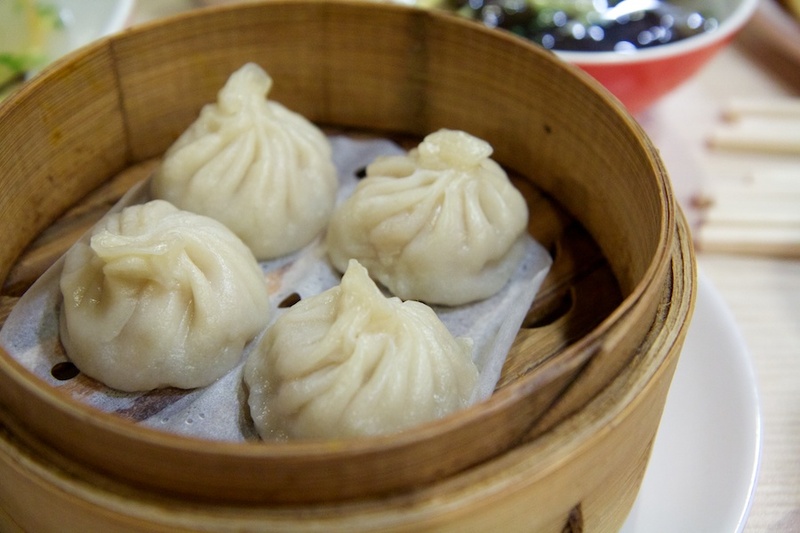 I quickly learned that dumplings are a staple in Shanghai, little bites of flavorful goodness; but in Shanghai you get something extra in your dumpling – soup. I had my first soup dumpling at breakfast (yes, dumplings for breakfast). I was startled when I bit into what I thought was a normal dumpling and soup came out and subsequently went all over me! I pretty quickly learned that Shanghai dumplings need to be eaten with care. 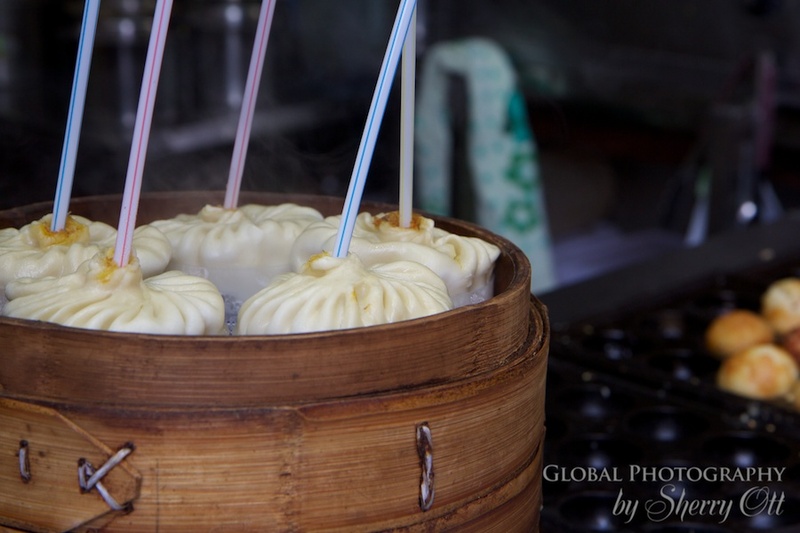 Shanghai is known for 2 main kinds of dumplings: Xiao Long Bao, a dumpling made of wheat dough that is steamed, and Sheng Jian Bao, made of a thicker dough first fried in a cast iron skillet and then steamed. Both are typically made of pork and have a gelatin soup inside that gets heated and liquefied when steamed. Dip them in a vinegar soy mixture and try to poke a hole in it first so that you can ‘drink’ out the soup or at least let it cool before you bite into it! My favorite way to eat them was with a straw. 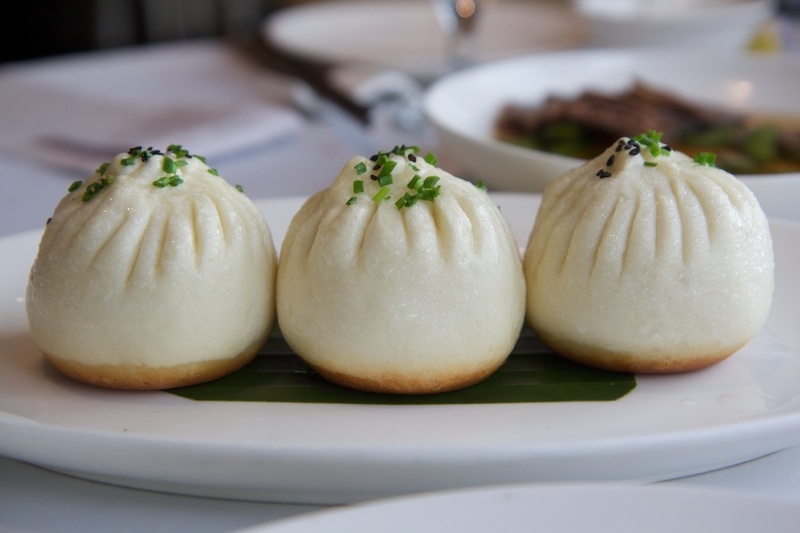 Xiao Long Bao – or XLB as the cool kids refer to them! 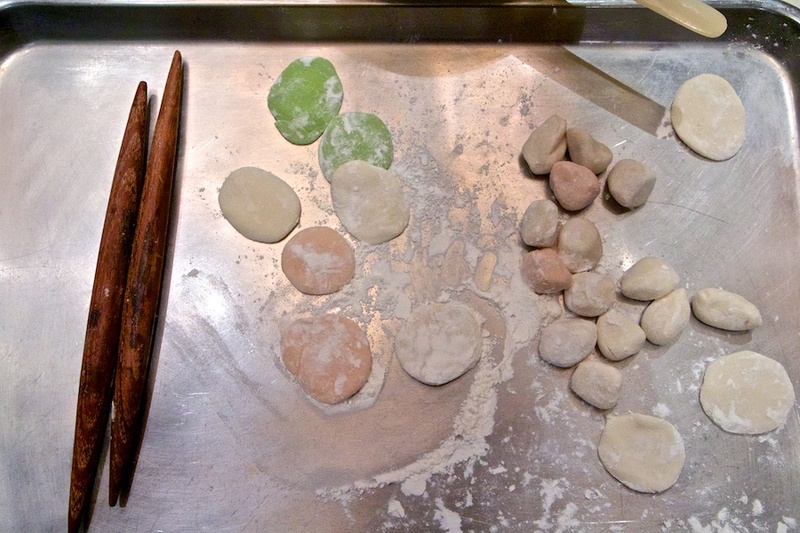 In Xi’an we not only ate dumplings (jiaozi), we learned how to make them. Our teacher, Chef Jin, makes about 3,500 dumplings a night, which explains why her super power is to make dumplings lightning fast. Seriously, if you blink you’ll miss it and will all of a sudden have a butterfly shaped dumpling in front of you. Chef Jin works at the Shaanxi Sunshine Lido Grand Theatre (and in the time it took you to read that title, she made 4 dumplings). She makes dumplings every night for customers who come to the cultural theater show. Her dumplings are in the shape of butterflies, roses, swans, cabbages, and ducks. However, for teaching purposes she kept the shapes simple and slowed down long enough to show us how to roll out the dough, spread in the filling, and then form them into shapes. Mine didn’t turn out too shapely, which made me conclude that I’d rather eat them than make them. 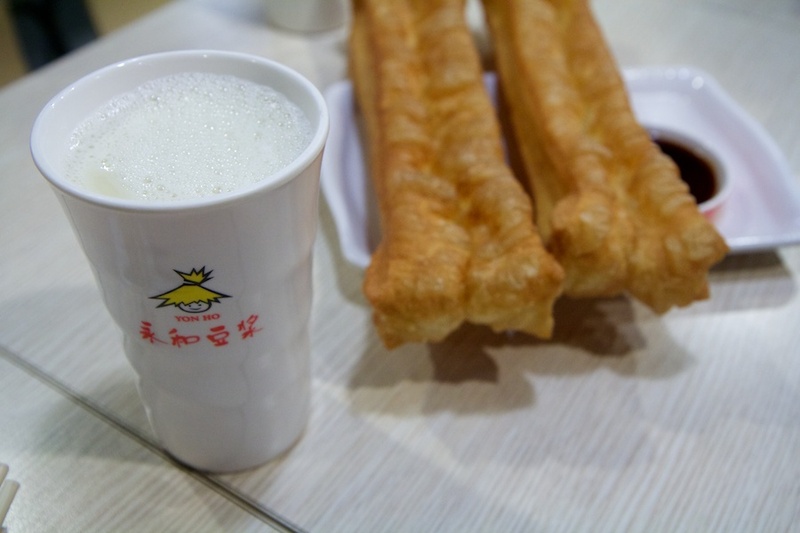 In our quest for local food, our Shanghai guide took us for a traditional breakfast enjoyed by the fast paced business workers in Shanghai – warm, sweet soymilk and a fried breadstick. Yon Ho is a fast food chain that started as a street stall in Taiwan and now sells their soybean milk all over China. The drink sort of tastes like what’s left in the bottom of a cereal bowl once all the cereal is gone and immediately won me over! It was fun to be the only foreigners in the restaurant and watch a steady stream of young business professionals come in and eat before work. Sort of like the Chinese Starbucks – a cool (and tasty) view of daily life in Shanghai! Have you ever heard a noodle? In Xi’an if you listen carefully you’ll hear why the Biangbiang noodle got its name. It is named after the sound of dough being thwacked on the chopping board so it can be stretched into one very long belt-like lasagna noodle. We stopped at a local food court inside the old city in Xi’an and saw the noodles being made and then slurped them down in a delicious broth mixture with soy, peppers, and scallions. And if you are wondering, in China it’s perfectly acceptable to slurp your noodles! 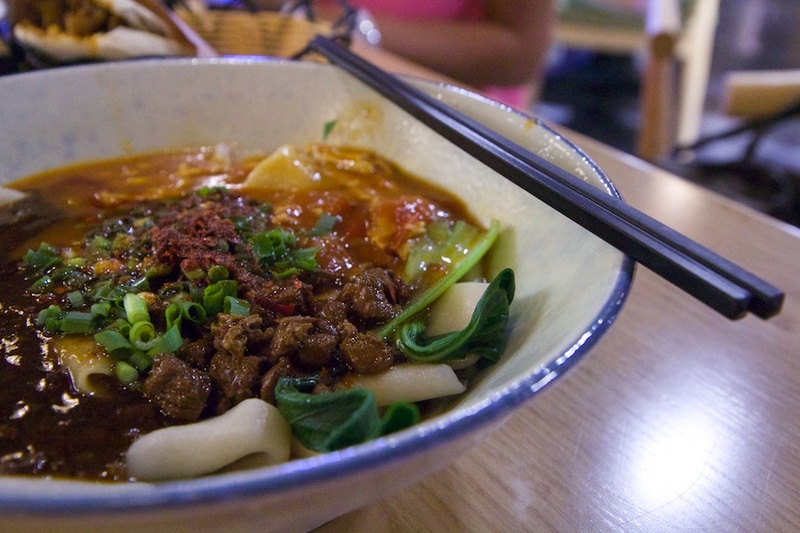 My other favorite noodle was the Peking noodle dish found in Beijing. The noodles are long, cylinder shaped, and delicious. My favorite part was that the noodles, vegetables, and sauce were brought out in separate bowls and it was up to us to mix the three items together at the table…with chopsticks. Good luck…the taste is worth it! Peking Noodles is a dish you need to put together yourself! 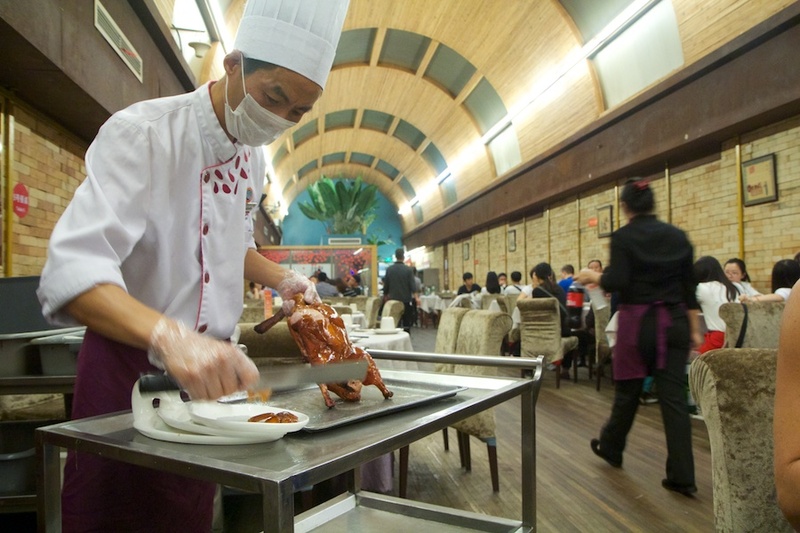 It might look slightly unappetizing to have a whole duck brought out to your table, but trust me on this and say ‘yes’ to Peking Duck when in Beijing! The duck is best known for its breeding and roasting process; plus it was once the food of Emperors. We went to Da Wan Ju, a small, local restaurant near the Wangfujing night market. Once the duck is carved by your table, you eat it in a pancake with scallions, cucumber and sweet bean sauce all rolled up like a taco. However, I’m not sure what I liked the most – the duck breast ‘taco’ or the crispy skin! For pure decadence, try dipping the crispy skin in sugar – the ultimate treat! 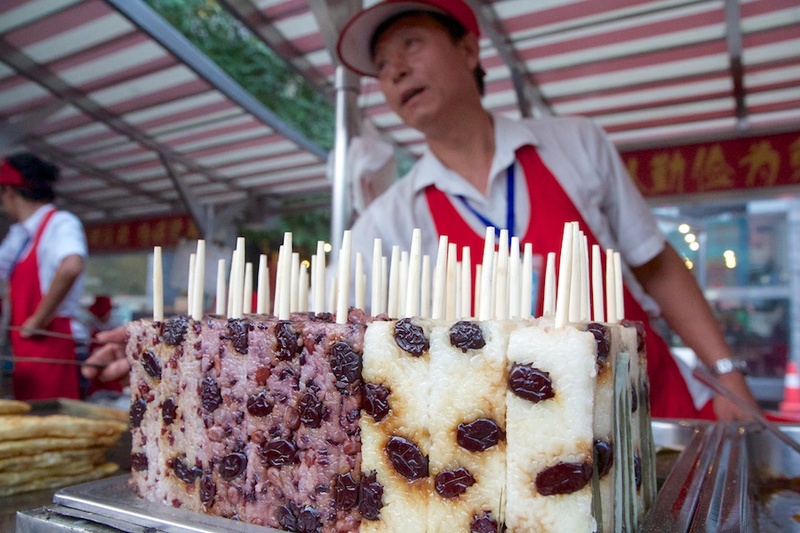 If you want to get a little bolder, then try the street food in China! Don’t get scared away by Beijing’s Wangfujing night market, which tends to cater to tourists more than locals. 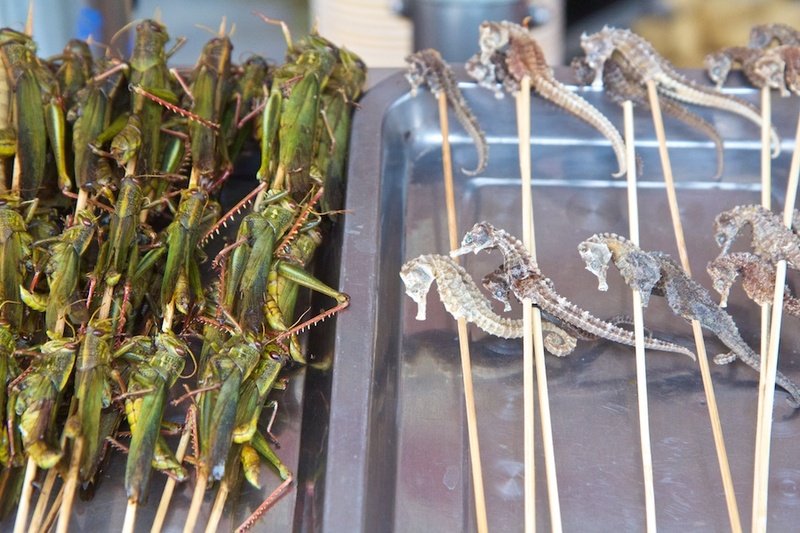 It’s a market with split personalities – it has a bunch of great traditional street food such as noodles, dumplings, and soups mixed with creepy crawlies on a stick. It’s definitely worth a visit to see how daring you are! I decided to try dessert there after our Peking Duck dinner, sweet sticky rice ‘pops’ on a stick were the perfect ending! Luckily I was already full when we came across these delicacies! Sticky rice pops – more my speed! There are plenty of other street markets selling food all over China’s cities that are geared to locals and your guide can help you find. Our guide led us to the Chang li neighborhood in Shanghai to try some local street food. Nestled among retail stores, the market smelled of durian and was filled with businessmen and women stopping to get dinner on their way home from work. The food is cooked right in front of you and I suggest you just pick the stand with the biggest line! The other great thing about local street food is it’s cheap; I had a giant noodle and veggie dish for only $1.20 USD. If you are looking for those crispy sweet fortune cookies at the end of you meal in China, you’ll be waiting forever. In fact 90% of Chinese people don’t even know what they are. One of my biggest surprises was learning that fortune cookies aren’t really from China at all; they are from the United States, created in San Francisco. The food in China was nothing like what I grew up eating at my family’s favorite Chinese restaurant in Peoria; instead it was infinitely better. And like most things in the world of travel, it’s even better when you can get out and explore the local scene, because it’s all about the journey. The world’s fifth largest country in both size and population, Brazil has much to offer, from beaches and mountains, to cities and nature. 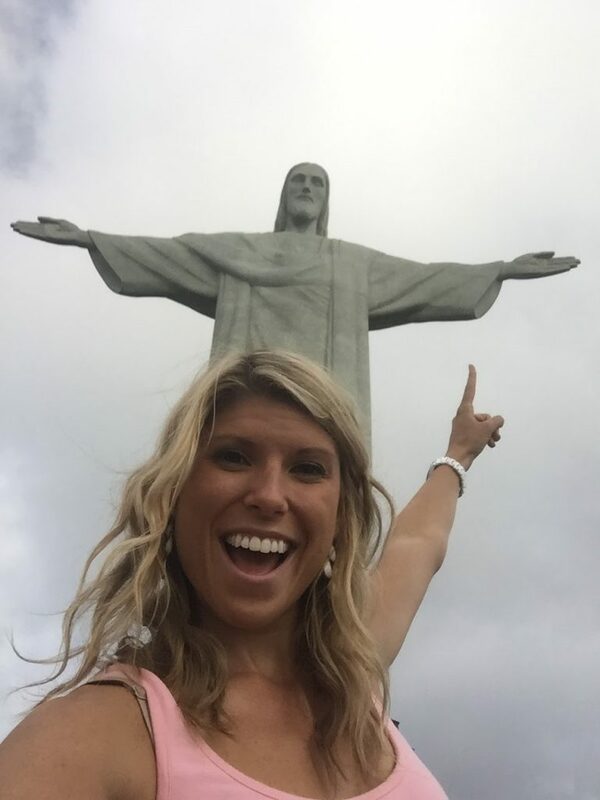 Join Kelley Ferro as she journeys through Brazil giving viewers a taste of the all diverse experiences encountered while on tour with a member of the United States Tour Operators Association. Videos in partnership with EMBRATUR and Adventure.com. Brazil is a country filled with adventure and active pursuits. 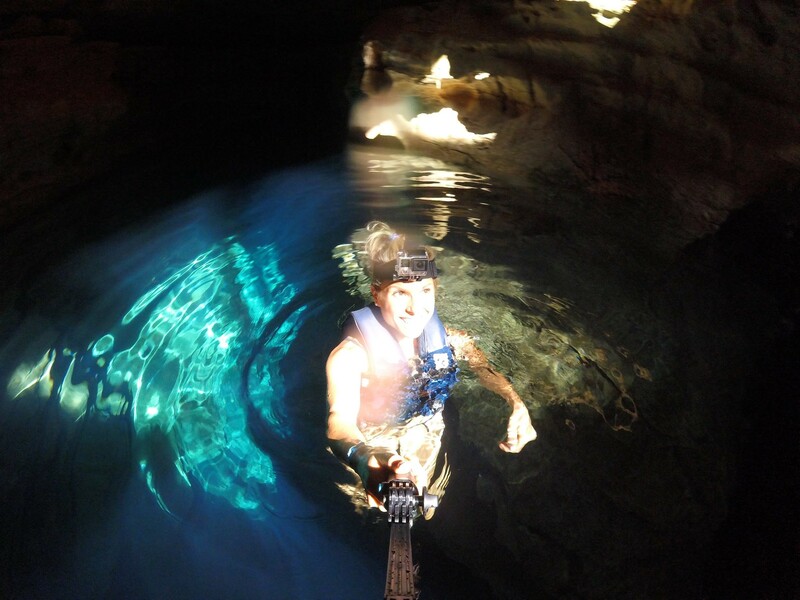 With the help of USTOA, EMBRATUR and Adventure.com, Kelley Ferro spends three days ziplining, grotto swimming, cave snorkeling, mountain hiking and photographing waterfalls in Chapada Diamantina National Park located in the Northeastern Brazilian state of Bahia. A melting pot of ethnicities, accents, and cultures, the food of Brazil is truly unique, offering a variety of dishes. 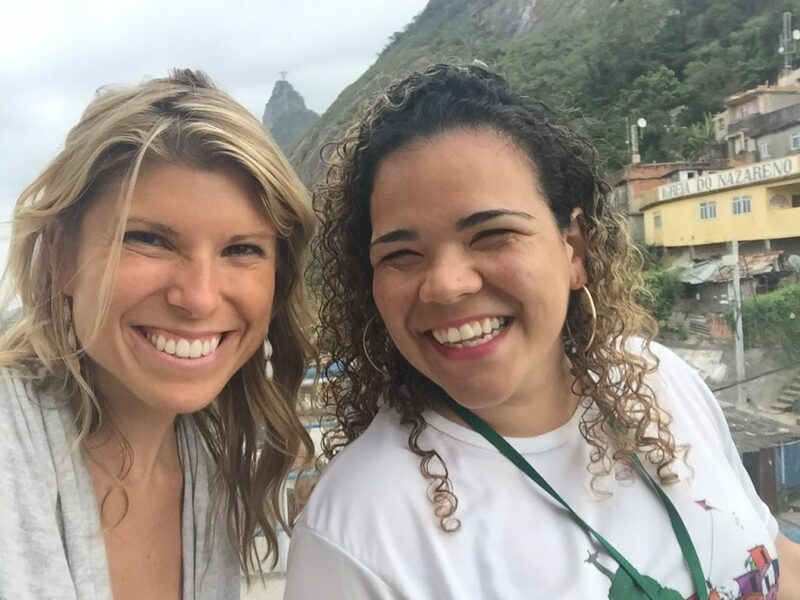 Join Kelley Ferro as she explores all the local flavors of Brazil while on tour with a member of the United States Tour Operators Association. Videos in partnership with EMBRATUR and Adventure.com. Rio de Janeiro is a large seaside city in Brazil, famed for its energy, beaches and Christ the Redeemer statue. With so much to see and do, members of the United States Tour Operators Association provide travelers with local guides to ensure guests don’t miss a beat of this lively city. 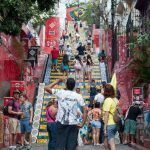 Tripfilms.com contributor Kelley Ferro gives an insider look at the nightlife, neighborhoods, shopping, locals and more in Rio. Videos in partnership with EMBRATUR and Adventure.com. 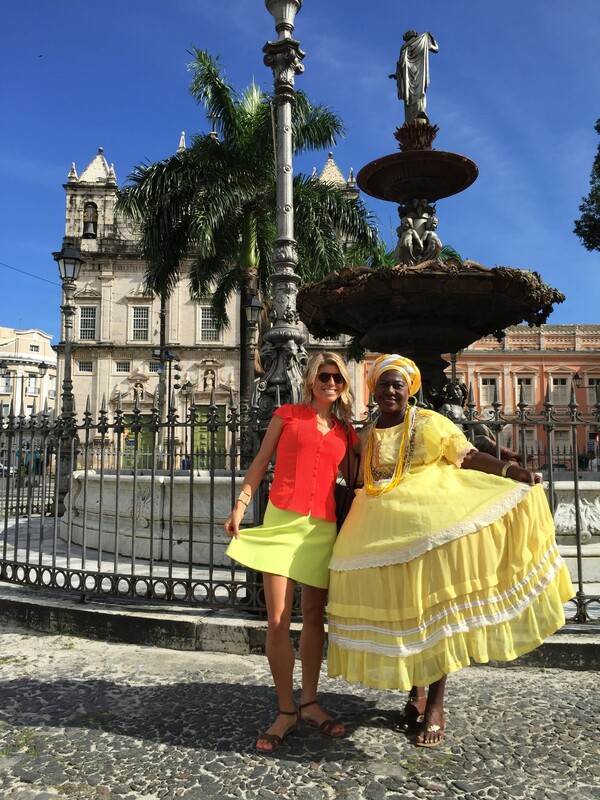 Video journalist Kelley Ferro starts her Brazil tour in Salvador, the capital of the Northeastern Brazilian state of Bahia. 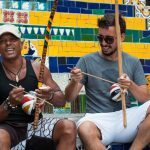 With the help of USTOA, EMBRATUR and Adventure.com, Kelley is immersed in the local Bahia culture from participating in the Brazilian tradition of the “Lembrança do Senhor do Bonfim da Bahia” wish bracelets to learning how to make Brazil’s national cocktail, the caipirinha. The mention of Rio conjures up images and emotions for everyone. A funky, hip, fun city, it is a mix of Mother Nature’s paradise and man-made amenities. It’s a place where coastal roads hug the huge craggy mountain faces that jut up towards the sky, and a place that throws one of the biggest parties on earth! 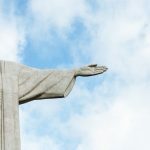 I had the pleasure of visiting Rio de Janeiro with EMBRATUR, Adventure.com and LATAM as a part of AFAR’s partnership with USTOA, and although we only had about a day to zip around the city, our itinerary took us to some of Rio’s timeless attractions along with a few that fly under most travelers’ radars. Our group woke early and took a bus up a winding, densely forested road to Corcovado Mountain, home of the iconic Christ the Redeemer statue. It was early enough that we beat the crowds, but unfortunately on this morning, we also beat the sunshine. Clouds, rain and haze surrounded the platform in front of Christ the Redeemer barraging the statue in a cloak of grey. After roughly 10 minutes, the cloud hovering overhead passed and revealed the statue in its full grandeur. Those that were present on the platform below began frantically taking pictures and selfies before another ominous cloud slowly rolled in, replacing the previous. As nice as it was to see the statue in front of a blue-sky backdrop, the quickly moving storm clouds made the statue even more impressive – all 98 feet of Christ’s form seemingly floating through a mass of haze. 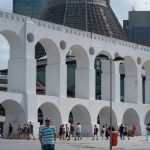 From Corcovado, our local guide, Rodrigo, and I split from the rest of the group and headed to one of Rio’s better known areas, the Lapa neighborhood – the yin to Copacabana and Ipanema’s beach-scene yang. 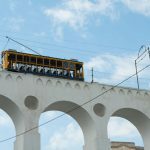 Lapa is a playground of motion and we quickly got caught up in the morning commuters buzzing about the streets, briefcases and aromatic coffee in tow. 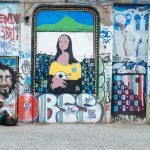 What I loved about Lapa was the eclectic mix of artistic influences from graffiti and murals to colonial architecture and oddly futuristic buildings – the embodiment of Rio, albeit on a smaller scale. 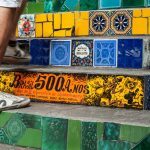 Undoubtedly, and for good reason, the coolest thing in Lapa is the Escadaria Selarón, a colorful, mosaicked set of steps embellished with bits of tile, ceramics and mirrors created by artist and former local Jorge Selarón. The Chilean-born Selarón began his beautification of the steps as a dedication to the Brazilian people, but what started as a small scale mosaic blew-up in scale and popularity through the years becoming an obsession for Selarón. In the later years of the project, visitors from all around the world donated tile to Selarón’s art piece. Walking up the steps, I found spotting the various cultural references fascinating as they really show how many people Selarón inspired with his art. 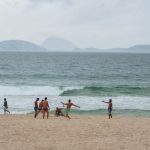 Later that afternoon, the same clouds that earlier graced the hem of Christ’s garment had relocated to Copacabana Beach. Fortunately, after a while the rain stopped and pedestrians started to emerge, repopulating the cycling lanes and walkways lining the beach. The little cafés brushed water off of their chairs and readied their bar stations, and even though the weather wasn’t ideal, it was easy to see why these beaches are so appealing. I sat down with a coffee and watched groups of men juggle a soccer ball while others competitively pummeled a volleyball back and forth. I didn’t get the picturesque beach-scene sunset that is often depicted in travel shows and movies but just being present and enjoying the distinctive vibe was rewarding enough. 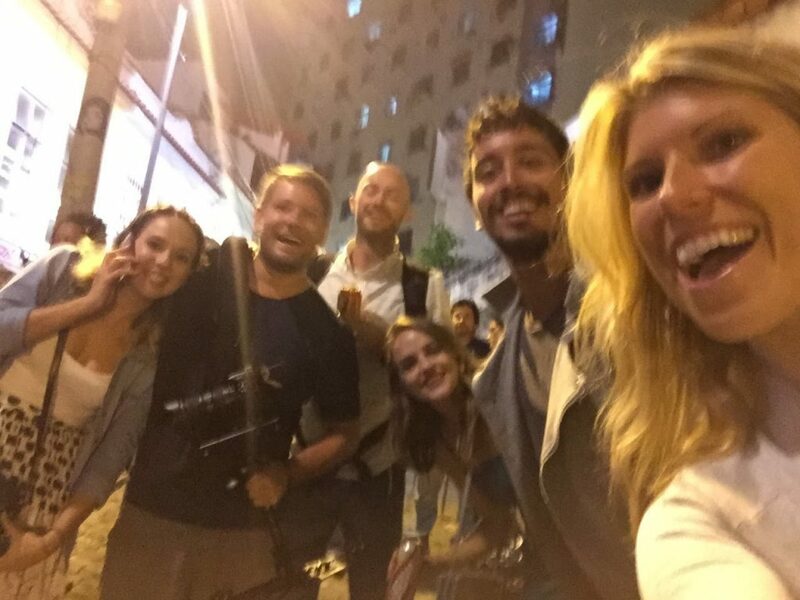 Later that evening our group headed back to Lapa to get a taste of the night life. As I suspected, the night crowd around Lapa was as energetic as the commuters I had encountered that morning. You could tell Rio de Janeiro is a city where citizens work and play equally as hard. As we walked toward a boulevard full of cafes and restaurants, we were sidetracked by a rhythmic raucous coming from inside a dimly-lit warehouse. We peaked inside and were greeted by the sound of drums thumping heavily while a circle of musicians swayed along to the beat. We watched for a while then headed back outside where tables and chairs began filling the sidewalks, making it tough to discern where one restaurant ended and another began. The whole area was filled with a cheery air, such as that of a family function. 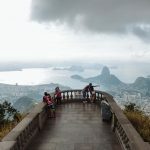 It was the perfect way to cap off a day in Rio de Janeiro, and surprisingly, I didn’t regret that I had only been able to explore for one day. It is such a charming city that it made a very vivid and lasting impression, one that will stick with me until my next visit! Colin Roohan is a travel photographer interested in documenting experiences with culture and life. In addition to his work with AFAR, Colin has been published in Travel + Leisure, The Royal Geographical Society’s Hidden Journeys, and Groove Magazine, amongst others. In addition to journalistic pursuits, Colin captures portraits and documents events around Southern California. 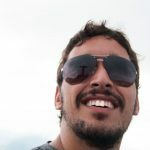 Hear more about his journey to Brazil at AFAR.com. “Okay, now make a wish,” said Deniza, a Bahian beauty and a press officer from Embratur (Brazilian Tourism Institute), as she tied one of three knots of a Bahia wish bracelet around my wrist. 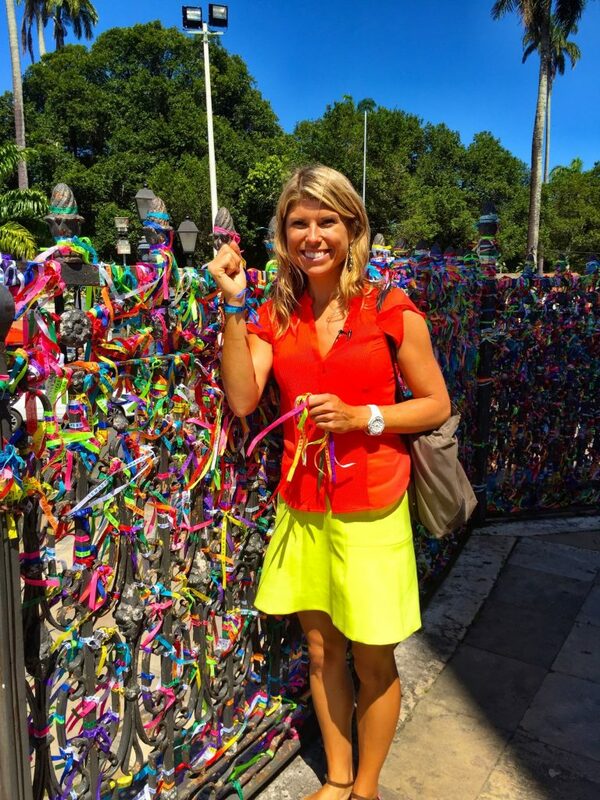 I had been familiar with a colorful Brazilian tradition of the “Lembrança do Senhor do Bonfim da Bahia” bracelets on my first visit to Rio de Janeiro, but it wasn’t till I was standing back in Brazil that I realized that these wishes do come true. Brazil is one of those special places that after you go once; you’ll want to go back again and again. My wishes were granted sooner than I expected when USTOA said they were sending me back to shoot our Live Like a Local series this past August. Back in 2013, I had spent a one week vacation fully immersing myself into the lifestyle of Rio de Janeiro. My days consisted of late breakfasts, runs along Ipanema Beach, boutique shopping in Leblon, slurping cool Acai in the afternoons and admiring the talented Brazilians play soccer during my tanning sessions on the beach. In my mind, Rio was as close to paradise as I could imagine. 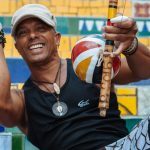 With the help of USTOA, Embratur, Adventure.com and our talented guides and ambassadors, my return trip to Brazil was equally as magical, and way more jam-packed with adventure. In just six days, we covered three cities, met a slew of locals and filmed our way through some of the country’s most epic sites. We started out in Bahia, a Brazilian state in the Northeast which has a distinct Caribbean flavor. Historically, the capital city of Salvador was the epicenter of the slave trade and it was the first stop on our itinerary. Approximately two million slaves helped grow Bahia’s booming sugar industry at that time. Thankfully, slavery was abolished there in the late 1800s, but the African influence still remains infused in the region’s personality. I saw it in the capoeira lesson that I took, a Brazilian martial art that was created and secretly practiced by the slaves of that time. I saw it in the food, like Brazil’s national dish feijoada which developed when slaves added leftover scraps of meat to their usual meal of rice and beans. I even saw it in the art such as paintings of the Afro-Brazilian religious deities that are as prominent as their Catholic counterparts. We continued our Bahia exploration with a stay in Lençóis, the jumping off point for a slew of natural wonders and outdoor adventures. This sleepy backpacker village was our laidback home, perfect for relaxing evenings. And we needed them, after spending our days spelunking, ziplining, grotto swimming, cave snorkeling, mountain hiking and photographing waterfalls. To conclude our Brazil adventure, we spent our last day in Rio. 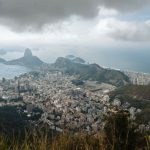 Arriving late in the evening and with an impending flight out at 5:00am the following day, my Rio de Janeiro repeat trip was condensed into 24 hours. And I made sure to make the most of each hour. Up well before dawn, I prepped for our last and only day in one of my favorite cities. Hair done and good walking shoes on, it was “go time” at 6:00am and off we went to beat the crowds at the top of Corcovado. 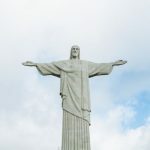 If I can give one tip to any first time visitors, go to see Christ the Redeemer AS SOON AS the doors open (8:00am) Besides a few other valiant travelers, we were the only people at the top of this world famous site. I felt like I spent a lot of time with Jesucristo, dividing my gaze between the majestic statue and the equally majestic view of this coastal city. But time was ticking and down we went to check out the Santa Teresa neighborhood, and area springing up with new cafes, art galleries and outdoor bars along the cobbled streets. Our local guide told us the backstory of this previously Portuguese aristocrat area as we poked our head in the shops. 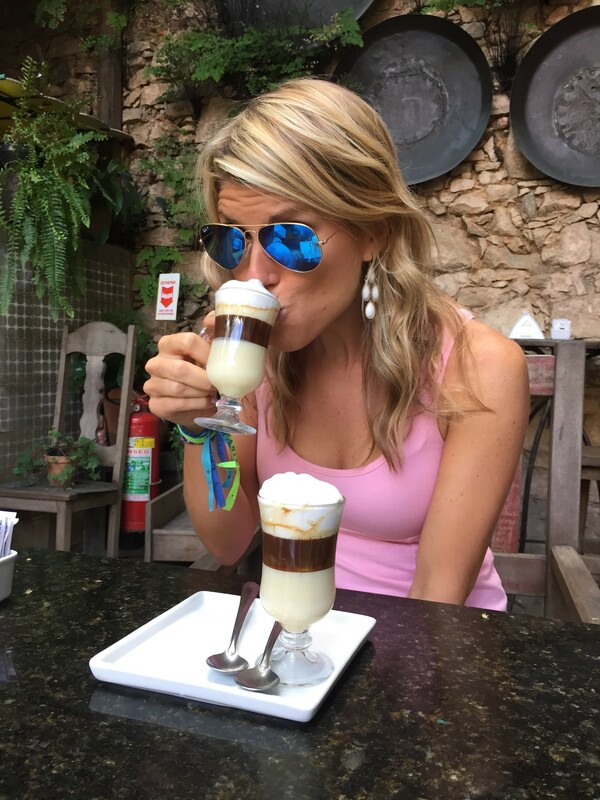 A quick pick me up of Brazil’s signature caffeinated beverage, and we were off to see the Selaron Steps, an explosion of colorful tiles from hundreds of cities and countries around the world. Rio’s enviable sunshine decided to take a pausa, so we did too for a refueling session at a Brazilian buffet while the rain cooled down the city. 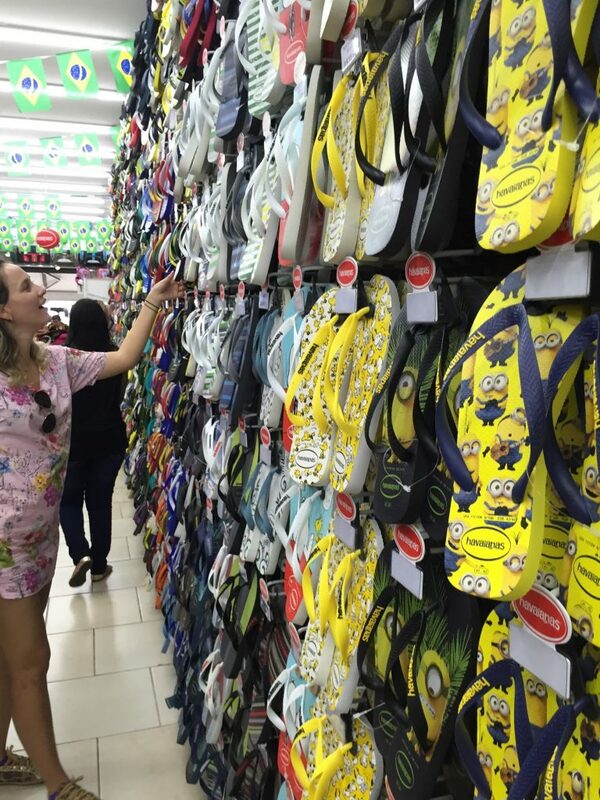 Lucky for me, the restaurant was next to a Havaianas store and Deniza, press officer from Embratur (Brazilian Tourism Institute) and local Bahian beauty, gave me a rundown of the best flip flop styles that weren’t found in the USA. I now have enough flip flops for the rest of my life. Without skipping a beat, it was time to explore a favela, something I hadn’t done in the past. 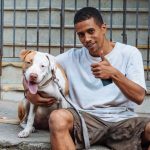 Our local guide brought us to the Santa Marta favela, a relatively small hilltop “slum” that has had one of the biggest positive transformations. We met Veronika, a local resident who guides visitors through her home community. Through a translator was needed, Veronika and I chatted about life here, her kids, Michael Jackson and about her thoughts for the future of her community. I could have spent all day here but it was on to the next part of the day, Rio’s famous beaches. The rain had passed but the clouds continued to hang out over Rio. Either way, Copacabana Beach still looked lovely and there we filmed some of the city’s favorite drinks, coconuts and caipirinhas. After my first bite of a dulce de leche churro (WOW! ), we transferred to the city center by subway. Traffic is brutal so the surprisingly clean and efficient underground metro was the fastest route. We arrived at an outdoor square where Monday night samba dancing takes place, to the tune of a live band. We weren’t the only ones camping out for this free show. However, the band canceled and so the dancing was postponed. Undeterred, we headed to Lapa to tour some of the bars of this neighborhood popular for nightlife. Rodrigo, our Brazilian guide, introduced us to a special aged cachaça and after a few rounds and many “saúdes” later, we were starving. 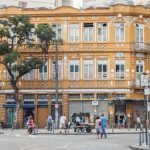 Where to eat in Rio when you only have one night? A churrascaria of course. This carnivorous restaurant was jam-packed even at 10:00pm. 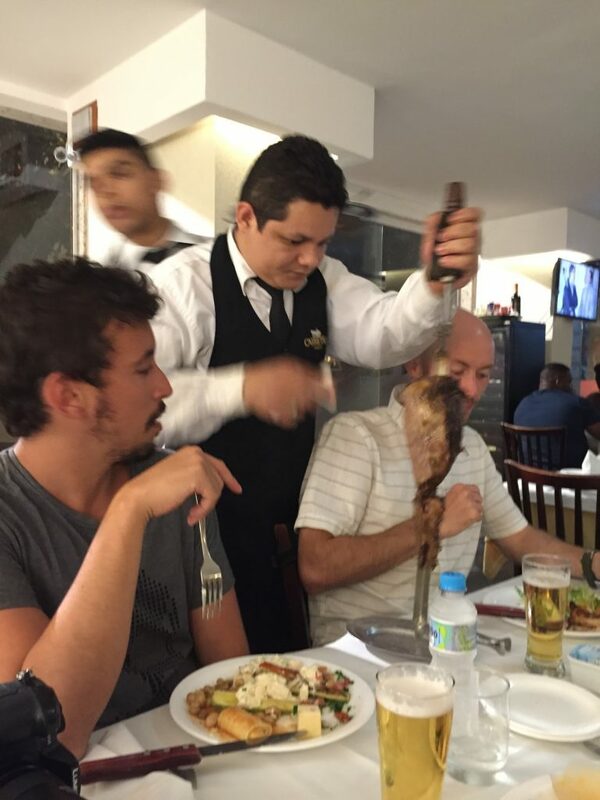 The churrascaria tradition is like a meat buffet that comes to you. Since I’m not a big meat eater, I enjoyed their insanely huge salad bar as our group tucked into to almost every type of meat that came out. As our manic day came to end right before my 2:00am transfer to the airport, I felt like we had really sucked the juice out of Rio. This city is non-stop and we did our best to keep up, from dawn… till dawn again. 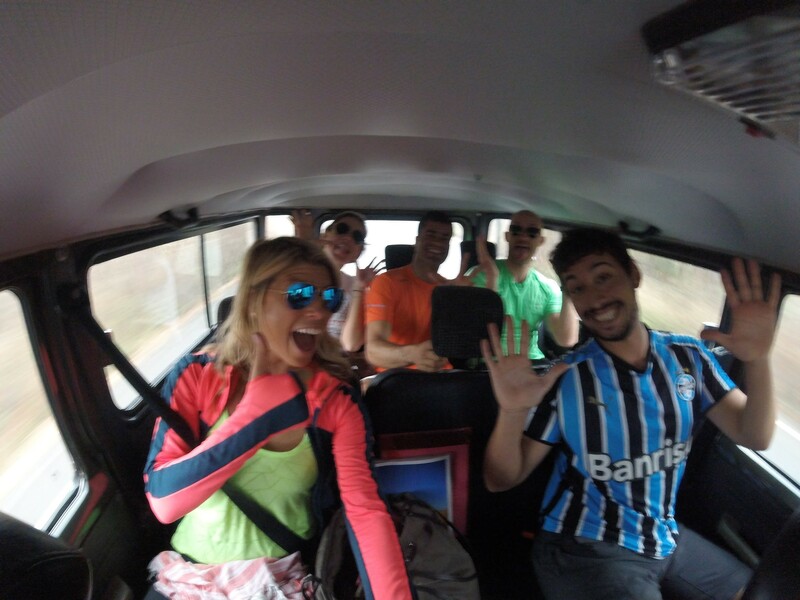 This trip was entirely different than my first leisurely week in Brazil. However, my love for the country has only grown. We did more in one day in Rio than many people do in a week, and I can say the same is true for each day on the rest of the trip. My knowledge of Brazil’s culture, hotspots and people has improved dramatically and from that, I only have a longer list of where I want to go when I return again. On that first wish bracelet back in 2013, I had wished to return to Brazil. Now, as I write this I am wearing my latest bracelet, given to me from Deniza. It’s my daily reminder that wishes come true and that I’ll be going back to Brazil on another adventure before long.